The European Brain Council is a non-governmental organisation comprising the major stakeholders in the field of brain research and brain disorders in Europe. 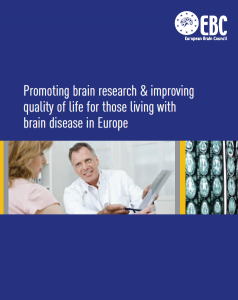 Established in March 2002, EBC focuses on the promotion of brain research and research on brain diseases as a route to improving the quality of life for those 127 million Europeans living with brain diseases. • Promoting dialogue between scientists and society.